Hospital negligence occurs when a hospital’s employees, internal communication system, or electronic medical record system fail to meet the standard of care. As a result of hospital negligence, patients may incur damages through inattentive or inappropriate medical care. In some instances, injury or death are caused by nurses, technicians, or administrators, rather than a doctor’s error. Two prime examples include medication errors and the failure to alert physicians of important changes to a patient’s condition. Hospitals are legally responsible for the negligent acts of their nurses and other employees as well as the failure of their internal record and communication systems. Hospitals are also legally responsible for allowing a physicians who have lost accreditation due to disciplinary reasons, or lack of continuing education, to perform surgery. Miller & Wagner recently concluded two dozen medical malpractice lawsuits against a Portland neurosurgeon. The hospitals continued to allowed him to operate on unsuspecting patients despite his lengthy and well-known history of unnecessary surgeries. Hospitalists tend to inpatients, and are in frequent contact with the patient’s primary care physician. They treat people in emergency scenarios when a patient’s doctor is unable to tend to sudden, unexpected symptoms or a worsening health condition. Hospitalists are expected to properly diagnose and effectively treat each patient they see to the best of their ability and knowledge. In some scenarios, damages incurred to those treated by a hospitalist may be attributed to hospital negligence. If you or a family member was injured due to misdiagnosis or improper medical treatment by a hospitalist in Oregon or Southwest Washington, contact an attorney at Miller & Wagner for a free case evaluation. Hospitals are required by law to provide their patients with the standard of care. This includes hiring licensed and qualified doctors, nurses, technicians, and other hospital staff. 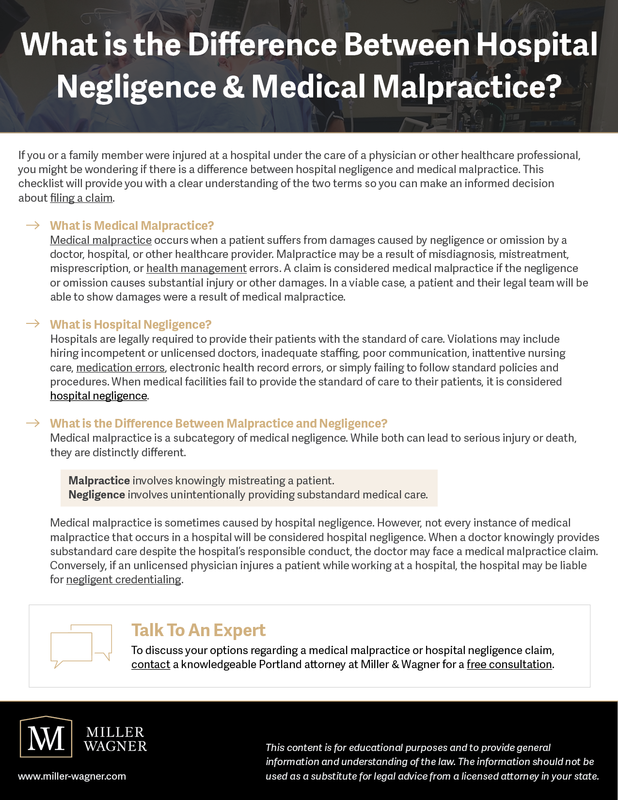 Failure to do so is considered hospital negligence, which can lead to medical malpractice. It is also illegal for hospitals or other medical facilities in Oregon and Washington grant credentials or privileges to physicians who are not licensed. Unless they demonstrate their competency through credentialing, doctors are not allowed to treat patients at hospitals or surgical centers. Physicians may lose their right to practice medicine for several reasons including disciplinary basis, lack of continuing education, or medical malpractice. The legal team at Miller & Wagner can review a doctor’s credentials and determine whether they were allowed to practice medicine at the hospital in which they are/were employed. When a hospital allows a physician without proper credentials to continue to treat patients at their facility, it may be held liable. To discuss the possibility of a hospital’s liability for medical malpractice with a knowledgeable attorney, contact Miller & Wagner in Portland for a free consultation. Substandard treatment in hospitals can result from a number of problems — inadequate staffing, poor communication between doctors and nurses, allowing poorly-trained or unskilled physicians to perform surgery, insurance-driven discharge decisions, or even the simple failure to follow standard policies and procedures. Miller & Wagner’s experience with the investigation and proof of hospital negligence claims can represent a powerful advantage for your damages claim. With more than 65 years of combined malpractice litigation experience, Dave Miller and Bob Wagner know how to identify the signs of hospital negligence and make an effective presentation of the evidence that proves it. The attorneys at Miller & Wagner are knowledgeable about the legal issues relating to hospital liability and physician errors. When determining the extent of liability is necessary for a hospital negligence case, we work with independent medical professionals to investigate and prepare evidence for recovering compensation for damages. Miller & Wagner advises and represents people with negligence claims against hospitals in both Oregon and Southwest Washington. For the advice of an experienced lawyer about the merits of your personal injury or wrongful death claim resulting from hospital negligence, contact our office in Portland for a free initial consultation.